Designing and building a landscape that complements its surroundings is a creative process. At All Seasons Lawn & Landscape, we thoroughly enjoy working with our clients to help turn visions into reality. No matter which stage of the planning process you find yourself, we can help move your project closer to completion. 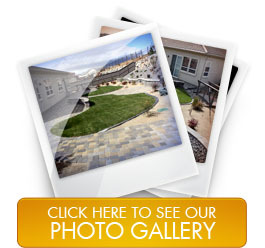 As a fully licensed and insured landscape contractor, we stand behind our work absolutely. Sod Installation – Our qualified team will gladly remove any old sod before installing our sod with Triple Mix Organic Soil. We will also perform a soil amendment in which we add necessary components to your soil to improve its performance as it pertains to water retention, permeability, water infiltration, drainage and more. Planters – From arrangements of simple flowerbeds and beautiful shrubs to multi-tier vegetable gardens to eye-catching raised structures, All Seasons will build you the most appealing and efficient planters for your space. Dry Creeks – A well-designed dry creek by All Seasons can enhance your landscape’s natural look and improve drainage. Our attractive dry creek beds can be functional or purely aesthetic; it all depends on your preferences and landscape needs. At Ponds & Waterfalls – At All Seasons, we create custom, decorative ponds and waterfalls to create lively, dynamic landscapes. We custom design each pond and waterfall with a variety of features to accent your yard and provide natural sound and movement. From infinity edges to splashing fountains to natural rock seating, All Seasons is experienced in designing and building intricate waterscapes. Planting – Vegetation is a cornerstone to creating compelling landscapes. Whether your yard is bare, sparse or in need of a makeover, All Seasons can recommend the kind of trees, plants, shrubs and flowers that will make the best use of your yard space. When planting, All Seasons uses only the best Triple mix soil in order to ensure healthy plant growth. Keeping factors in mind such as length of seasons, water consumption and growth potential, we can create landscapes that are both efficient and enjoyable.